THE ELEARNING SYMPOSIUM IS BACK! Following a three-year break, the department of Modern Languages and Linguistics at the University of Southampton is delighted to invite you to the new re-branded eLearning symposium, previously successfully run by LLAS, the Centre for Languages, Linguistics and Area Studies. New perspectives: eLearning symposium rebooted. Language learning and technology in new educational landscapes. This one-day event will enable participants to discuss innovative teaching and learning practices in the ever-transforming educational landscape, where technology constantly challenges and opens new horizons both to teaching practitioners and learners. 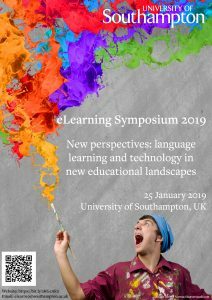 Modern Languages and Linguistics at the University of Southampton will hold the 12th in a series of e-learning symposia on 25th January 2019. This popular event was formerly organised the LLAS, the Centre for Languages, Linguistics and Area Studies. The aim of the symposium is to seek to bridge the gap between the ‘techie’ and the teacher, giving educators ideas to help them integrate e-learning into their practice but also to inspire them to see where the online future could lead. The symposium is always well-attended by practitioners from a wide range of disciplines and institutions. The one-day symposium comprises practical presentations to inspire the mind with exciting ideas about the possibilities that teaching and learning with technology offer. Attendees will experience a range of content from areas of more specific interest to our core language teaching and learning, to topics of wider interest to educators involved in e-learning. We highlight best practice in using e-learning and feature an exciting mixture of research and reflection from practice to inspire our community. Call for Papers now CLOSED!